© 2018 El Hefnawy et al. The study aims to assess the real-world incidence of hypoglycemia in patients with Type 1 Diabetes Mellitus (T1DM) or Type 2 Diabetes Mellitus (T2DM) in Egypt cohort of the International Operations Hypoglycemia Assessment Tool (IO HAT) study. 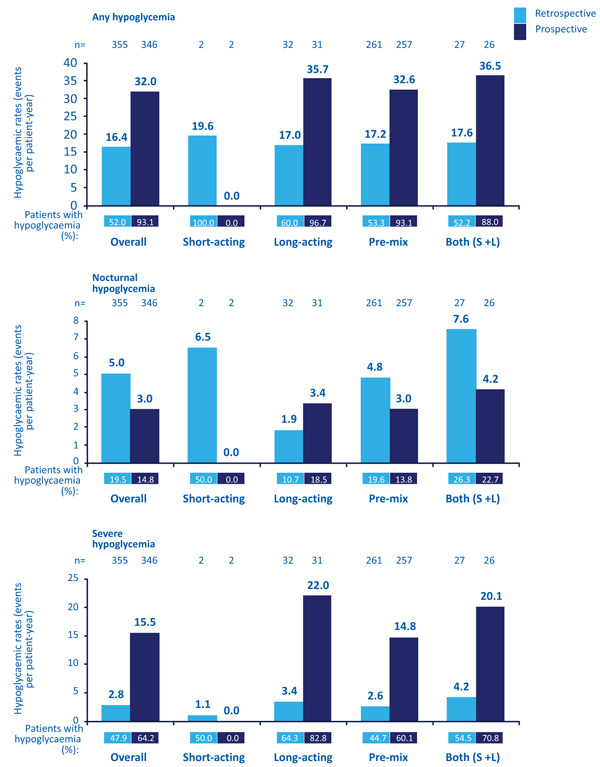 This is a non-interventional study to estimate hypoglycemia in eligible patients with T1DM or T2DM, aged ≥18 years and treated with insulin for >12 months, who have completed self-assessment questionnaires to record demography, treatment information, and hypoglycemia during the 6-month/4-week retrospective and 4-week prospective periods. Data on hypoglycemia for this sub-analysis were collected from DM patients of Egyptian cohort who were recruited in IO HAT study across 36 sites in Egypt between 22 Nov 2014 and 15 Apr 2015. Percentage of patients who reported at least one hypoglycemic event in the prospective period was any: T1DM: 96.3% (95% confidence interval [CI]: 89.6%, 99.2%) and T2DM: 93.1% (95% CI: 89.8%, 95.6%) and severe: T1DM: 67.5% (95% CI: 56.1%, 77.6%) and T2DM: 64.2% (95% CI: 58.7%, 69.4%). An estimated rate of any and severe hypoglycemia in the prospective period was 63.3 (95% CI: 57.2, 69.9) events per patient year (PPY) and 28.9 (95% CI: 24.8, 33.4) events PPY, respectively, for patients with T1DM and 32.0 (95% CI: 29.8, 34.3) events PPY and 15.5 (95% CI: 14.0, 17.1) events PPY, respectively, for patients with T2DM. Hypoglycemic rate was independent of glycated hemoglobin levels. The self-reported hypoglycemia data from Egypt confirms that hypoglycemia is under-reported. The high impact of hypoglycemia on the Egyptian DM patients and healthcare system warrants patient education to prevent hypoglycemia. Keywords: Hypoglycemia, Insulin, Diabetes Mellitus, International Operations Hypoglycemia Assessment Tool, Egypt, Type 1 Diabetes Mellitus, Type 2 Diabetes Mellitus. Lifelong insulin therapy in Type 1 Diabetes Mellitus (T1DM) patients and therapy with insulin alone or in combination with other oral hypoglycemic agents in Type 2 Diabetes Mellitus (T2DM) patients often lead to common side effect like hypoglycemia . Amiel et al. observed that there is increased risk of hypoglycemia in elderly patients and in patients with longer duration of diabetes and tight glycemic control . The American Diabetes Association (ADA) defined hypoglycemia as abnormally low plasma glucose concentration that exposes the patient to potential harm . The mild-to-moderate symptoms of hypoglycemia include blurred vision, hunger, headache, weakness, arrhythmias, myocardial ischemia, and cardiac failure. The severe hypoglycemic symptoms include convulsions, coma, and stroke . Major studies on Diabetes Mellitus (DM) related morbidity and mortality have denied any of the reported deaths being linked to hypoglycemia, though patients who experienced severe hypoglycemia did have significantly higher mortality rates [5-7]. An epidemiological survey in Egypt revealed that the fear of hypoglycemia among patients with T2DM on insulin, influenced DM patients or their physicians to often reduce the insulin dose that resulted in poor control of diabetes in Egyptian population. In addition, most diabetes care in Egypt happens in the private sector hospitals with no formal referral systems and the treatment costs are paid through out-of-pocket expenses by diabetes patients. Other routine tests like glycated hemoglobin (HbA1c) or renal function tests and Self-monitoring of blood glucose (SMBG) are uncommon because such tests are relatively expensive for most Egyptian DM patients . A study from primary health care facilities in Alexandria has reported similar findings that most of the DM patients in Egypt, because of misconceptions and false beliefs about diabetes and fears of finger pricks, often resist insulin injections or SMBG . Furthermore, the study observed that healthcare providers in Egypt lack in educating patients on self-management of DM for proper diabetes care . Evidence showed that randomized controlled trials (RCTs), which are the gold standard for comparing the safety and efficacy of new therapeutic agents, have limitations on the external validity due to controlled nature of such trials in terms of study design and inclusion and exclusion criteria . Observational studies have proven to be effective to study the efficacy and safety of new therapeutic agents in real-world clinic settings. A prospective, observational, multicultural real-world clinical study in Africa, Asia, and Europe involving 365 T2DM patients from Egypt reported the rate of severe hypoglycemia at 0.04 episode/patient-year (95% CI: 0.023, 0.055 episode/patient-year) . Unfortunately, there is a lack of large-scale hypoglycemic studies involving Egyptian T1DM and T2DM patients. Hence, the need for a large-scale hypoglycemic study in Egyptian T1DM or T2DM patients that will help to identify the incidence, rate, and risk factors of hypoglycemia and to evaluate the impact of hypoglycemia on the Egyptian health systems is required. The International Operations Hypoglycemia Assessment Tool (IO HAT) builds on information gathered as part of the GLOBAL HAT study . This study was an international, multicenter study designed to assess the incidence of hypoglycemia in DM patients treated with insulin (pre-mix, short-acting, long-acting, or insulin pump) in Bangladesh, Colombia, Egypt, Indonesia, the Philippines, Singapore, South Africa, Turkey, and United Arab Emirates . This sub-analysis of Egyptian diabetes patients was performed with an aim to assess the incidence and rates of hypoglycemia, the relationship between hypoglycemia and HbA1c levels, and how hypoglycemic events affected healthcare resources in Egypt. 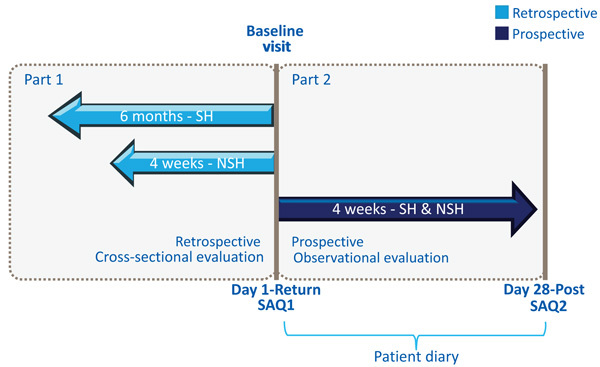 The IO HAT study was a non-interventional, multicenter, international, 6-month/4-week retrospective and 4-week prospective assessment on self-reported hypoglycemia with a two-part self-assessment questionnaire (SAQ1 and SAQ2) and a patient diary (PD) for 28 days among insulin-treated T1DM or T2DM patients (Fig. 1). Data on hypoglycemia for this sub-analysis were collected from DM patients of Egyptian cohort who were recruited in the IO HAT study from 36 sites distributed across Egypt between 22 Nov 2014 and 15 Apr 2015. The study was approved by local ethics committees and health authorities and carried out in accordance with Good Pharmaco-epidemiological Practice and the Declaration of Helsinki: Ethical Principles for Medical Research Involving Human Patients [14, 15]. The study materials were translated into local languages and data acquired were translated back into English for analysis. Fig. (1). IO HAT study design. Severe hypoglycemia: an event requiring assistance of another person to actively administer carbohydrate, glucagon, or other resuscitative actions. Non-severe hypoglycemia: documented symptomatic (symptoms and blood glucose measurement ≤3.9 mmol/L [70 mg/dL]) and probable symptomatic (symptoms only) hypoglycemia. NSH, Non-Severe Hypoglycemia; SAQ: Self-Assessment Questionnaire; SH: Severe Hypoglycemia. Eligible T1DM or T2DM patients from Egypt cohort, who were ≥18 years of age at enrollment, on insulin regimen for >12 months (short-acting, long-acting, pre-mix, and short- plus long-acting), ambulatory, literate, and had signed the informed consent form, were included in the study. The patients were enrolled during the course of their regular planned clinical check-ups with their physicians at the healthcare centers in Egypt. The patients were not recommended any specific treatments during their participation in this study. The SAQ1 was used to record data on potential confounding variables (including but not limited to patient age, duration of diabetes, duration of insulin treatment, treatment regimen, and diabetes-related late complications and glycemic control). In addition, the data on Hypoglycemia Unawareness (HU), perceptions of hypoglycemia, and history of severe hypoglycemia over previous 6 months and history of any and nocturnal hypoglycemia over the previous 4 weeks were collected at baseline in the presence of the participant’s Health Care Professional (HCP) in order to improve accuracy. The authors did not have any control on the inclusion of potential confounding variables. Moreover, in real-world clinical practice, the oral hypoglycemic agents are used to address the issue of insulin resistance in patients with T1DM who have inherited genetic insulin resistance. Although acarbose is not contraindicated in patients with T1DM but is not recommended for use in T1DM by guidelines. The SAQ2 was used to collect information prospectively of severe, any, and nocturnal hypoglycemia over the 4 weeks after the study entry and the filled questionnaire was returned at the end of the study. The PD was used to record any hypoglycemic episodes occurring over 4 weeks from baseline and to assist recall of hypoglycemic events by the patients. In case of any discrepancies of the frequency of hypoglycemia collected between the PD entries and the SAQ2 questionnaire, the frequency of hypoglycemia was calculated using the highest recorded total frequency as stated on either of these tools. Differences in self-reported hypoglycemia between the retrospective and prospective periods were used to estimate under-reporting. Use of health system resources following hypoglycemia was assessed as per the following categories: Hypoglycemic event resulting in hospitalization of DM patients, attended additional clinical appointments, and additional telephone contacts with the hospitals. Patient behavior against hypoglycemia was assessed using the following actions: consulted their nurse/doctor, required any form of medical assistance, increased calorie intake, avoided physical exercise, reduced insulin dose, skipped insulin injections, and increased SMBG. Patient knowledge of hypoglycemia was assessed by checking if the patient’s definition was consistent with the ADA definition of hypoglycemia  and if they knew what hypoglycemia was before they read the introduction provided in the Informed Consent Form (ICF). Fear of hypoglycemia was assessed using patient’s response on a scale of 0 to 10, with 0 representing ‘not afraid at all’ and 10 representing ‘absolutely terrified’. Hypoglycemia unawareness was evaluated through the self-assessment question: ‘Do you have symptoms when you have a low sugar level?’ where the response ‘always’ and ‘usually’ denoted normal hypoglycemia awareness, ‘occasionally’ denoted impaired hypoglycemia awareness, and ‘never’ denoted severely impaired hypoglycemia awareness . The primary objective of the study was to assess the percentage of patients experiencing at least one hypoglycemic event during the 4-week prospective period among insulin-treated patients with T1DM or T2DM. The secondary objectives were to assess the difference in the reported incidence of hypoglycemia between the 4-week retrospective (for any/nocturnal hypoglycemia) and 6-month retrospective (for severe hypoglycemia) and 4-week prospective period among insulin-treated patients with T1DM or T2DM and relationship between incidence of hypoglycemia and duration of diabetes (1.0 to <7.0 years of diabetes, 7.0 to <12.0 years of diabetes, 12.0 to <18.0 years of diabetes, and 18.0 to 60.0 years of diabetes), HbA1c at baseline (HbA1c level <7.0%, 7.0% to 9.0%, and >9.0%), and types of insulin therapy. The use of health system resources following hypoglycemia and patient behaviors against hypoglycemia were also studied as described above. Other secondary outcomes evaluated were patient knowledge of hypoglycemia (before and after entering the study), fear of hypoglycemia, and hypoglycemia awareness. Nocturnal hypoglycemia is any event occurring between midnight and 06:00 am. Severe hypoglycemia is defined based on the ADA definition, as an event requiring the assistance of another person to actively administer carbohydrate, glucagon, or other resuscitative actions . Any hypoglycemia is a combined measure based on the sum of all individual hypoglycemic events of any categories and this was calculated based on PD, SAQ1, and SAQ2 entries. The primary objective, percentage of patients who experienced at least one hypoglycemic episode during the 4-week prospective period among insulin-treated patients with T1DM or T2DM, was calculated together with 95% confidence interval (CI). The secondary objective, incidence rates of hypoglycemia, was reported as events per patient-year (PPY), calculated as the total number of events divided by total follow-up time in patient-years together with 95% CI. Statistical tests were two-sided and regarded as exploratory, with the criterion for statistical significance set at p<0.05. No adjustments were made for multiple comparisons. No imputation of missing data was performed as majority of analyses were descriptive in nature. Baseline refers to data collected using the SAQ1; follow-up refers to data collected using the SAQ2 and, where applicable, PD. Descriptive baseline characteristics of Egyptian cohort are provided in Table 1. The total enrolled population in the Egyptian cohort was 443 patients (T1DM, N=88; T2DM, N=355) that completed SAQ1 and were included in full analysis set (FAS). Of these, 429 patients (T1DM, N=83 [94.3%]; T2DM, N=346 [97.5%]) completed SAQ2 and PD. Patients with T1DM were younger than patients with T2DM (mean age 37.9 years vs. 57.4 years, respectively). Both T1DM and T2DM patients had a similar duration of diabetes (14.2 years vs. 14.3 years, respectively). Insulin usage in patients with T1DM was started by diagnosis, hence T1DM patients had a longer duration of insulin usage than T2DM patients (T1DM: 11.8 years of insulin use and T2DM: 7.1 years of insulin use). Mean HbA1c at baseline was similar in patients with T1DM and T2DM (8.7% and 8.3%, respectively). At baseline, majority of patients with T1DM were using pre-mix insulin (59.1%) (Table 1). In patients with T2DM, the most common diabetes treatments were metformin (65.1%) and pre-mix insulin (73.5%). Overall, in the Egyptian cohort, human insulin was used by 61.7% of patients. At baseline, 69.3% of patients with T1DM and 51.0% of patients with T2DM checked blood sugar levels with their own glucose meter. Table 1. Patient demographic characteristics. *Data are presented as mean (standard deviation) unless otherwise stated; BMI: Body Mass Index; FBG: Fasting Blood Glucose; HbA1c: glycated hemoglobin; PPG: Postprandial Glucose; SGLT2: Sodium-glucose co-transporter 2; N: total number of patients participating; †percentages based on number of patients with evaluable data; n: number of subjects in the data subset; T1DM: Type 1 Diabetes Mellitus; T2DM: Type 2 Diabetes Mellitus. A higher percentage of patients with T1DM reported at least one hypoglycemic event in the 4-week prospective period when compared with the 4-week retrospective period (96.3% [95% CI: 89.6%, 99.2%] vs. 62.7% [95% CI: 51.3%, 73.0%]). Similarly, higher percentage of patients with T2DM reported at least one hypoglycemic event in the 4-week prospective period when compared with the 4-week retrospective period (93.1% [95% CI: 89.8%, 95.6%] vs. 52.0% [95% CI: 46.4%, 57.5%]). For patients with T1DM or T2DM, the incidence rates of any hypoglycemia significantly increased from the 4-week retrospective period to 4-week prospective period; T1DM: from 24.9 [95% CI: 21.3, 29.2] events PPY to 63.3 [95% CI: 57.2, 69.9] events PPY, p<0.001 and T2DM: from 16.4 [95% CI: 14.9, 18.1] events PPY to 32.0 [95% CI: 29.8, 34.3] events PPY, p<0.001 (Fig. 2). A higher percentage of patients with T1DM reported at least one hypoglycemic event in the 4-week prospective period when compared with the 4-week retrospective period (41.0% [95% CI: 30.0%, 52.7%] vs. 31.5% [95% CI: 21.1%, 43.4%]). In contrast, higher percentage of patients with T2DM reported at least one hypoglycemic event in the 4-week retrospective period when compared with the 4-week prospective period (19.5% [95% CI: 15.2%, 24.4%] vs. 14.8% [95% CI: 11.1%, 19.2%]). For patients with T1DM or T2DM, the incidence rates of nocturnal hypoglycemia were comparable between the 4-week retrospective and 4-week prospective period (T1DM: 11.8 [95% CI: 9.1, 15.0] events PPY and 13.7 [95% CI: 10.9, 17.0] events PPY, respectively, p=0.553; T2DM: 5.0 [95% CI: 4.2, 6.0] events PPY and 3.0 [95% CI: 2.4, 3.8] events PPY, respectively, p=0.030) (Fig. 2). Fig. (2). Percentage of patients and rates of hypoglycemia during retrospective and prospective periods (a) T1DM, (b) T2DM. ‘Any’ and ‘Nocturnal’ hypoglycemia based on 4-week period for both retrospective and prospective analyses. *Retrospective data based on 6-month period and prospective data based on 4-week period. RR, rate ratio; T1DM: Type 1 Diabetes Mellitus; T2DM: Type 2 Diabetes Mellitus. A higher percentage of patients with T2DM reported at least one hypoglycemic event in the 4-week prospective period when compared with the 6-month retrospective period (64.2% [95% CI: 58.7%, 69.4%] vs. 47.9% [95% CI: 42.3%, 53.6%]). A slightly higher percentage of patients with T1DM reported at least one hypoglycemic event in the 6-month retrospective period when compared with the 4-week prospective period (73.4% [95% CI: 62.3%, 82.7%] vs. 67.5% [95% CI: 56.1%, 77.6%]). For patients with T1DM, the incidence rates of severe hypoglycemia increased significantly from 6.3 [95% CI: 5.5, 7.1] events PPY in the 6-month retrospective period to 28.9 [95% CI: 24.8, 33.4] events PPY in the 4-week prospective period; while for patients with T2DM, the incidence rates significantly increased from 2.8 [95% CI: 2.5, 3.1] events PPY in the 6-month retrospective period to 15.5 [95% CI: 13.9, 17.1] events PPY, p<0.001 in the 4-week prospective period (Fig. 2). For patients with T1DM, the incidence rates of any hypoglycemia (from 42.2 events PPY to 64.7 events PPY) between the three periods of duration of diabetes (7.0 to <12.0 years of diabetes, 12.0 to <18.0 years of diabetes, and 18.0 to 60.0 years of diabetes) were comparable in the 4-week prospective period. However, the incidence rate of any hypoglycemia (106.0 events PPY) was exceptionally higher in the first period of the duration of diabetes (1.0 to <7.0 years of diabetes) when compared with other periods in the prospective period (Fig. 3). In patients with T2DM, the incidence rates of any hypoglycemia reported between the four periods of duration of diabetes were ranging from 26.9 events PPY to 35.1 events PPY in the prospective period (Fig. 3). Fig. (3). Percentage of patients and rates of any, nocturnal, and severe hypoglycemia by duration of diabetes in T1DM and T2DM. 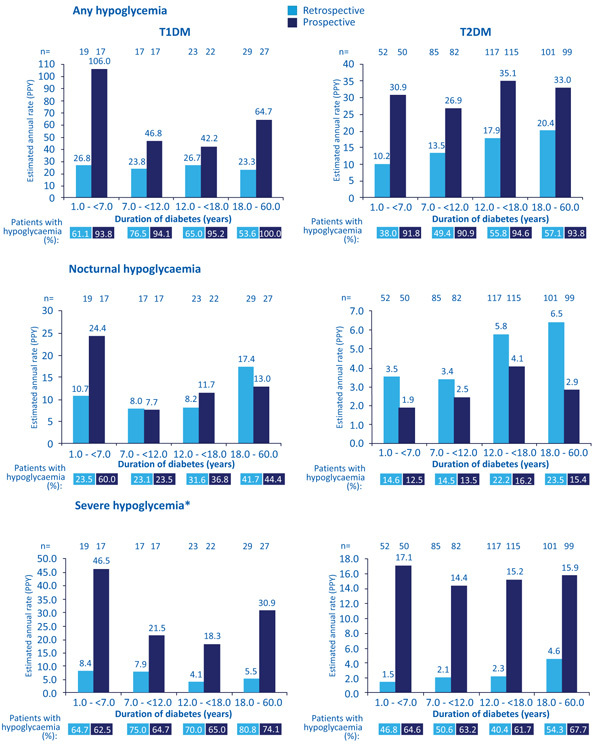 Percentages represent percent of patients with hypoglycemia in each quartile. *Data for severe hypoglycemia based on the 6 months before baseline for the retrospective period and the 4 weeks after baseline for the prospective period. PPY: Per Patient-Year; T1DM: Type 1 Diabetes Mellitus; T2DM: Type 2 Diabetes Mellitus. For patients with T1DM, no association was observed between the percentage of patients with any hypoglycemia and baseline HbA1c levels in the 4 weeks before the baseline period. However, there was increase in the percentage of T1DM patients with any hypoglycemia (85.7%, 96.6%, and 100.0%) with an increase in the baseline HbA1c levels (<7.0%, 7.0%-9.0%, and >9.0%, respectively) in the 4 weeks after the baseline period. For patients with T2DM, there was no association observed between the percentages of patients with any hypoglycemia and baseline HbA1c levels in both 4 weeks before baseline and 4 weeks after baseline periods. In addition, a scatter plot with regression line and 95% CI for patients with T1DM or T2DM showed no association between HbA1c levels and hypoglycemic events (data not shown). For patients with T1DM, there was a higher reported incidence rate of any and severe hypoglycemia in the 4-week prospective period, irrespective of the insulin regimens, when compared with the incidence rates in the 6-month (for severe hypoglycemia) and 4-week (for any hypoglycemia) retrospective periods. Similarly, incidence rates of nocturnal hypoglycemia were higher in the 4-week prospective period, irrespective of insulin regimens, when compared with the rates in the 4-week retrospective period, except in those patients who were on pre-mix insulin (retrospective rate vs. prospective rate; 12.2 events PPY vs. 8.0 events PPY, respectively). The incidence rates of any, nocturnal, and severe hypoglycemia were exceptionally high in patients with T1DM who were on short-acting insulin regimens during the 4-week prospective period (208.7 events PPY, 65.2 events PPY, and 163.1 events PPY, respectively) when compared with the incidence rates in the 6-month (for severe hypoglycemia) and 4-week (for any/nocturnal hypoglycemia) retrospective periods. For patients with T2DM, there was a higher reported rate of any and severe hypoglycemia in the 4-week prospective period, irrespective of insulin regimens, when compared with the incidence rates in the 6-month (for severe hypoglycemia) and 4-week (for any hypoglycemia) retrospective periods, except in those patients who were on short-acting insulin regimen (Fig. 4). However, higher incidence rates of nocturnal hypoglycemia were observed in patients with T2DM in the 4-week retrospective period, irrespective of insulin regimens, when compared with the rates in the prospective period, except in those patients who were on long-acting insulin regimen (Fig. 4). Overall, the impact of hypoglycemic events on the medical system (hospital admissions, additional clinic appointments, and telephone contacts with the hospitals) was observed to be mostly high in the retrospective period when compared with similar data in the prospective period (for both T1DM and T2DM patients) (Table 2). The mean number of hospital admission days following a hypoglycemic event in patients with T1DM was 1.0 day and in patients with T2DM was 0.3 day in the 6-months before the baseline period; while the mean number of hospital admission days following hypoglycemic events were lower in the 4 weeks after the baseline period for both patients with T1DM (0.2 day) and T2DM (0.1 day) (Table 2). Table 2. Patient response to hypoglycemia and impact of hypoglycemia on medical system. N: total number of subjects participating; *Percentages based on number of patients with evaluable data; T1DM: Type 1 Diabetes Mellitus; T2DM: Type 2 Diabetes Mellitus. Fig. (4). Estimated rate of any, nocturnal, and severe hypoglycemic event during retrospective and prospective period, by insulin regimen in T2DM. *Data based on 4-week period for both retrospective and prospective analyses; ‡Retrospective Data based on 6-month period and prospective data based on 4-week period. S+L: Short-acting and Long-acting insulin; T2DM: Type 2 Diabetes Mellitus. A higher percentage of patients with T1DM had reported taking action following hypoglycemia when compared with the percentage of patients with T2DM. The most common responses during the retrospective and prospective periods were: requiring any form of medical assistance (T1DM/T2DM: 75.0%/43.9% and 54.2%/37.0%, respectively), consulted a doctor or nurse (T1DM/T2DM: 71.8%/41.1% and 54.2%/36.7%, respectively), and increased blood glucose monitoring (T1DM/T2DM: 54.5%/34.6% and 51.8%/33.8%, respectively) (Table 2). A higher percentage of patients with T1DM (64.8%) and T2DM (52.2%) knew the overall definition of hypoglycemia before reading the definition in SAQ1. The majority of patients in both groups defined hypoglycemia on the basis of symptoms alone (T1DM: 50.0%; T2DM: 60.0%), while a very small percentage of patients (T1DM: 3.4%, T2DM: 3.9%) defined hypoglycemia on the basis of blood glucose measurements (Table 3). Table 3. Patient perspectives on hypoglycemia. †Either symptoms or blood glucose measurement; ‡Both symptoms and blood glucose measurements; N: total number of subjects participating; *Percentages based on number of patients with evaluable data; SD: Standard Deviation; T1DM: Type 1 Diabetes Mellitus; T2DM: Type 2 Diabetes Mellitus. A higher percentage of patients (T1DM: 69.3%; T2DM: 61.4%) had impaired hypoglycemia awareness, as they were only occasionally aware of symptoms when experiencing a low BG measurement. Normal hypoglycemic awareness was reported by 26.1% and 25.1% of patients with T1DM and T2DM, respectively. While severely impaired hypoglycemia awareness was observed in 1.1% in T1DM group and 6.5% in T2DM group. The percentages of patients with T1DM or T2DM, who rated fear of hypoglycemia based on a scale of 1 to 10, are given in Table 3. At baseline, patients with T1DM and T2DM showed more similarity with respect to fear of hypoglycemia, with a mean (standard deviation) score of 5.1 (3.1) for patients with T1DM and 4.8 (2.9) for patients with T2DM. This subanalysis of IO HAT study presents the data set of self-reported hypoglycemia that assessed hypoglycemia incidence and rates in insulin-treated patients with T1DM or T2DM in Egypt cohort. In this cohort, percentage of patients with T1DM (73.4%) who reported at least one severe hypoglycemic event during the 6-months retrospective period is much higher when compared with the percentage of patients with T1DM with severe hypoglycemia in the retrospective period as reported in the earlier studies (29.2% of patients with T1DM reported in Mac Leod et al. and 40.5% of patients with T1DM reported in ter Braak et al.) . In addition, in a cross-sectional Danish-British multicenter survey of 1076 consecutive adult patients with T1DM, overall 36.7% of patients reported severe hypoglycemia . Moreover, in this cohort, a higher rate of severe hypoglycemia (6.3 events PPY) during the 6-month retrospective period in patients with T1DM was reported, when compared with hypoglycemic rates (from 1.3 events PPY to 1.6 events PPY) previously reported in the European studies [17, 18]. Also, a higher percentage of patients with T2DM (64.2%) reported severe hypoglycemic events in the prospective period when compared with 2.5%  and 6.0%  of patients with T2DM reported by a real-world study and systematic review and meta-analysis of population-based studies, respectively. A very high percentage of patients with T2DM reporting severe hypoglycemic events in this cohort than that in other real-world studies may be due to patient’s failure to clearly understand the differences between severe hypoglycemia and non-severe hypoglycemia in this cohort. Similarly, patients with T2DM in this cohort reported higher rates of severe hypoglycemia (15.5 events PPY) during the prospective period when compared with 0.04 severe hypoglycemic episodes/patient-year as reported in a multinational hypoglycemic study involving 365 Egyptian patients with T2DM , 1 event PPY as reported by Edridge et al. , 0.7 events PPY reported in U.K hypoglycemia study , and 0.35 events PPY reported by Donnelly et al. . During the prospective period, the incidence rates of severe hypoglycemia (T1DM: 28.9 events PPY and T2DM: 15.5 events PPY) reported by the Egyptian cohort of IO HAT is much higher when compared with the severe hypoglycemic rates (T1DM: 4.9 events PPY; T2DM: 2.5 events PPY) as reported by the global HAT study, which included 27,585 patients with diabetes from 24 countries . In this cohort, patients with T1DM reported higher annual rates of any hypoglycemia (63.3 events PPY) in the prospective period when compared with the annual rates of any hypoglycemia as reported in other studies like UK hypoglycemia study group trial (42.9 events PPY)  and Donnelly et al. (42.9 events PPY) . Similarly, patients with T2DM reported higher rates of any hypoglycemia (32.0 events PPY) during the prospective period when compared with previously reported hypoglycemic rates from Donnelly et al. (16.37 events PPY) , Action to Control Cardiovascular Risk in Diabetes (ACCORD) trial , the Veterans Affairs Diabetes Trial (VADT) with 383-1333 events per 100 patient years , the Action in Diabetes and Vascular Disease: Preterax and Diamicron MR Controlled Evaluation (ADVANCE) trial , and the Diabetes Control and Complications Trial (DCCT) . A higher percentage of patients with T2DM reporting nocturnal hypoglycemia in the retrospective period than that in prospective period may be due to patient’s failure to clearly recognize nocturnal hypoglycemia that occurred between midnight and 06:00 am. In addition, recall bias in patients with T2DM could have affected the reporting of nocturnal hypoglycemia during the retrospective period. Also, annual rates of nocturnal hypoglycemia for patients with T1DM or T2DM during the prospective periods observed in this cohort is much higher when compared with similar rates from the earlier hypoglycemic study , while the reported rates of nocturnal hypoglycemia in this cohort are comparable with the hypoglycemic rates (T1DM: 11.3 events PPY; T2DM: 3.7 events PPY) reported in the global HAT study . We observed that a higher percentage of patients with T1DM or T2DM reported at least one hypoglycemic event during the prospective period of the study when compared with the retrospective period. The higher hypoglycemic rates reported during the prospective period may be attributed to the better recall of events by the DM patients who used the patient diary to record the hypoglycemic events in the prospective period. The patient diary was used as a tool to assist in the recall of events. However, the hypoglycemic events during the retrospective period that were recorded at baseline using a self-assessment questionnaire, may be biased due to the failure of the patients to recall all the hypoglycemia events in the retrospective period. This recall bias could have possibly resulted in under-reporting of the events from the retrospective period. At baseline, just over half of the patients with T1DM and T2DM (64.8% and 52.2%, respectively) had knowledge about hypoglycemia. Hence, one may expect that DM patients with less knowledge about hypoglycemia may have difficulty in recognizing and reporting the incidence of hypoglycemic events. The SAQ1 was used as an educational tool to reinforce patient knowledge about hypoglycemia at study entry and hence, majority of patients with T1DM or T2DM reported higher rates of any and severe hypoglycemic events in the prospective period than the retrospective period, which is a true representation of a clinical setting. Hegazi et al. reported that health illiteracy is very common in Egypt. Poor adherence to SMBG in patients with T2DM in Egypt may be due to the high cost of glucose test strips or fear of frequent finger pricks . In addition, a higher percentage of patients with T1DM and T2DM from Egypt cohort had impaired hypoglycemia awareness (69.3% and 61.4%, respectively). As seen from the results above, higher frequency of hypoglycemic events in patients with T1DM or T2DM in the Egyptian cohort may be one of the reasons for high hypoglycemia unawareness. Evidence has shown that frequent occurrences of hypoglycemia in diabetes patients itself induced the high hypoglycemia unawareness . Koura et al., reported the existence of a serious gap between Egyptian physicians and patients in the provision of patient education on hypoglycemic management . Studies have shown that checking the frequency of hypoglycemia resulted in increased recognition of hypoglycemia symptoms and restoration to normal awareness . These facts stress on educating DM patients to prevent frequent hypoglycemia. Further, patient education on adjusting insulin doses based on diet and exercise, a clear understanding of hypoglycemia including the ability to predict hypoglycemia based on early hypoglycemia symptoms and patterns, regular SMBG, and accessing the health care immediately or taking assistance from others to recover from severe hypoglycemia are required. Similar to the results from the global HAT study , there was no association observed between hypoglycemic rates and HbA1c levels in both T1DM and T2DM patients . Evidence from a European study involving 37,539 children and young adults with T1DM has shown that due to the advances in the treatment of diabetes, the inverse association between HbA1c levels and hypoglycemia has decreased in the last decade . Moreover, the results from patients with T2DM have shown that hypoglycemia is independent of HbA1c levels and hypoglycemia was common at all HbA1c levels [30, 31]. Also, it has been shown that the risk of hypoglycemia was higher in diabetes patients with either near-normal glycemia or uncontrolled glycemia . As recommended by diabetes treatment guidelines, patients should be provided individualized treatment for specific HbA1c targets  and physicians need to educate patients that tight glycemic control with insulin therapy if required, would not necessarily increase the risk of hypoglycemia. Strengths of this study include its prospective, observational study design, which allows for capturing real-world hypoglycemic rates and its impact on patient and health care system. As with any other observational study that collects retrospective data, one of the limitations of this study is recall bias. Diabetes patients who participated in this study recorded a hypoglycemic event based on either symptoms or blood glucose testing alone or in combination. This type of assessment may be considered as advantageous where in routine practice, patients may forget or neglect to test blood glucose, did not know the blood glucose concentration cut-off for hypoglycemia, or were unable to test due to a lack of testing devices/materials. However, the subjective nature of this assessment of hypoglycemia creates opportunities for confusion and hence may be considered as a disadvantage. In addition, when compared with other insulin regimens more than half of the patients with T1DM (59%) in the Egyptian cohort were on pre-mix insulin regimen. This may have resulted in a higher percentage of patients with T1DM reporting hypoglycemia. This is one of the limitations of this cohort of the study. Hypoglycemia impacts not only the wellbeing of the diabetic individuals but also imparts significant burden on the cost to health care systems . Due to hypoglycemic events, diabetes patients had availed hospital admission, additional clinic appointments, and made telephone contacts with the hospitals. The results for this cohort showed the high impact of hypoglycemia on the health care system in Egypt and suggest that patients with T1DM or T2DM require additional incentives in the way of insurance and structured referral programs to reduce their healthcare costs. In conclusion, these results on self-reported dataset on hypoglycemia in patients with T1DM or T2DM in Egypt showed that hypoglycemia is under-reported. To prevent hypoglycemia in Egyptian DM patients, educating them not to skip or delay meals or snacks, regular monitoring of blood glucose, and adjusting medication or eating additional snacks if there is an increase in physical activity is highly important. This study was approved by the Research Ethics Committee - GOTHI (General Organization for Teaching Hospitals and Institutes), and the Research Ethics Committee of the Research and Health Development of MOH. The reported experiments were carried out in accordance with Good Pharmaco-epidemiological Practice and the Declaration of Helsinki: Ethical Principles for Medical Research Involving Human Patients. Financial support for the conduct of the research was provided by Novo Nordisk. Novo Nordisk was involved in the study design; collection, analysis and interpretation of data; and decision to submit the article for publication. Authors, Dalia Nabil Toaima and Mohamed Ahmed Gaber Maree are employees of Novo Nordisk. There is no conflict of interest for authors Mohamed Hesham Mohamed Fahmy El Hefnawy, Atef Abdelmoniem Bassyouni, Hesham Magdeldin Saleem, and Mohsen Mostafa Mussa Khalid. Author, Talaat Abd el Fattah Abdelaaty has received speaker fees from Sanofi-Aventis, Novo Nordisk, Lilly, AstraZeneca, MSD, Novartis, and Servier. Statistical analysis was performed by Paraxel International. The authors acknowledge medical writing and submission support provided by Cognizant Technology Solutions, funded by Novo Nordisk. DeWitt DE, Hirsch IB. Outpatient insulin therapy in type 1 and type 2 diabetes mellitus: Scientific review. JAMA 2003; 289(17): 2254-64. Amiel SA, Dixon T, Mann R, Jameson K. Hypoglycaemia in type 2 diabetes. Diabet Med 2008; 25(3): 245-54. Seaquist ER, Anderson J, Childs B, et al. Hypoglycemia and diabetes: A report of a workgroup of the american diabetes association and the endocrine society. Diabetes Care 2013; 36(5): 1384-95. Bonds DE, Miller ME, Bergenstal RM, et al. The association between symptomatic, severe hypoglycaemia and mortality in type 2 diabetes: Retrospective epidemiological analysis of the ACCORD study. BMJ 2010; 340: b4909. Zoungas S, Patel A, Chalmers J, et al. Severe hypoglycemia and risks of vascular events and death. N Engl J Med 2010; 363(15): 1410-8. Bedenis R, Price AH, Robertson CM, et al. Association between severe hypoglycemia, adverse macrovascular events, and inflammation in the edinburgh type 2 diabetes study. Diabetes Care 2014; 37(12): 3301-8. Hegazi R, El-Gamal M, Abdel-Hady N, Hamdy O. Epidemiology of and risk factors for type 2 diabetes in egypt. Ann Glob Health 2015; 81(6): 814-20. Koura MR, Khairy AE, Abdel-Aal NM, Mohamed HF, Amin GA, Sabra AY. The role of primary health care in patient education for diabetes control. J Egypt Public Health Assoc 2001; 76(3-4): 241-64. Martin K, Bégaud B, Latry P, Miremont-Salamé G, Fourrier A, Moore N. Differences between clinical trials and postmarketing use. Br J Clin Pharmacol 2004; 57(1): 86-92. Pīrāgs V, El Damassy H, Dąbrowski M, et al. Low risk of severe hypoglycaemia in patients with type 2 diabetes mellitus starting insulin therapy with premixed insulin analogues BID in outpatient settings. Int J Clin Pract 2012; 66(11): 1033-41. Khunti K, Alsifri S, Aronson R, et al. Rates and predictors of hypoglycaemia in 27 585 people from 24 countries with insulin-treated type 1 and type 2 diabetes: The global HAT study. Diabetes Obes Metab 2016; 18(9): 907-15. Emral R, Pathan F, Cortés CAY, et al. Self-reported hypoglycemia in insulin-treated patients with diabetes: Results from an international survey on 7289 patients from nine countries. Diabetes Res Clin Pract 2017; 134: 17-28. Andrews EB, Arellano FM, Avorn J, et al. Guidelines for Good Pharmacoepidemiology Practices (GPP). Pharmacoepidemiol Drug Saf 2008; 17(2): 200-8. Pedersen-Bjergaard U, Pramming S, Thorsteinsson B. Recall of severe hypoglycaemia and self-estimated state of awareness in type 1 diabetes. Diabetes Metab Res Rev 2003; 19(3): 232-40. MacLeod KM, Hepburn DA, Frier BM. Frequency and morbidity of severe hypoglycaemia in insulin-treated diabetic patients. Diabet Med 1993; 10(3): 238-45.
 ter Braak EW, Appelman AM, van de Laak M, Stolk RP, van Haeften TW, Erkelens DW. Clinical characteristics of type 1 diabetic patients with and without severe hypoglycemia. Diabetes Care 2000; 23(10): 1467-71. Pedersen-Bjergaard U, Pramming S, Heller SR, et al. Severe hypoglycaemia in 1076 adult patients with type 1 diabetes: Influence of risk markers and selection. Diabetes Metab Res Rev 2004; 20(6): 479-86. Edridge CL, Dunkley AJ, Bodicoat DH, et al. Prevalence and incidence of hypoglycaemia in 532, 542 people with type 2 diabetes on oral therapies and insulin: A systematic review and meta-analysis of population based studies. PLoS One 2015; 10(6): e0126427. UK Hypoglycaemia Study Group UKHS. Risk of hypoglycaemia in types 1 and 2 diabetes: Effects of treatment modalities and their duration. Diabetologia 2007; 50(6): 1140-7. Donnelly LA, Morris AD, Frier BM, et al. Frequency and predictors of hypoglycaemia in Type 1 and insulin-treated Type 2 diabetes: A population-based study. Diabet Med 2005; 22(6): 749-55. Miller ME, Bonds DE, Gerstein HC, et al. The effects of baseline characteristics, glycaemia treatment approach, and glycated haemoglobin concentration on the risk of severe hypoglycaemia: Post hoc epidemiological analysis of the ACCORD study. BMJ 2010; 340: b5444. Duckworth W, Abraira C, Moritz T, et al. Glucose control and vascular complications in veterans with type 2 diabetes. N Engl J Med 2009; 360(2): 129-39. Patel A, MacMahon S, Chalmers J, et al. Intensive blood glucose control and vascular outcomes in patients with type 2 diabetes. N Engl J Med 2008; 358(24): 2560-72. Nathan DM, Genuth S, Lachin J, et al. The effect of intensive treatment of diabetes on the development and progression of long-term complications in insulin-dependent diabetes mellitus. N Engl J Med 1993; 329(14): 977-86. Agesen RM, Kristensen PL, Beck-Nielsen H, et al. Effect of insulin analogs on frequency of non-severe hypoglycemia in patients with type 1 diabetes prone to severe hypoglycemia: Much higher rates detected by continuous glucose monitoring than by self-monitoring of blood glucose-The HypoAna Trial. Diabetes Technol Ther 2018; 20(3): 247-56. Mitrakou A, Fanelli C, Veneman T, et al. Reversibility of unawareness of hypoglycemia in patients with insulinomas. N Engl J Med 1993; 329(12): 834-9. Karges B, Rosenbauer J, Kapellen T, et al. Hemoglobin A1c Levels and risk of severe hypoglycemia in children and young adults with type 1 diabetes from Germany and Austria: A trend analysis in a cohort of 37, 539 patients between 1995 and 2012. PLoS Med 2014; 11(10): e1001742. Lipska KJ, Warton EM, Huang ES, et al. HbA1c and risk of severe hypoglycemia in type 2 diabetes: The diabetes and aging study. Diabetes Care 2013; 36(11): 3535-42. Inzucchi SE, Bergenstal RM, Buse JB, et al. Management of hyperglycemia in type 2 diabetes: A patient-centered approach: Position statement of the American Diabetes Association (ADA) and the European Association for the Study of Diabetes (EASD). Diabetes Care 2012; 35(6): 1364-79. Geelhoed-Duijvestijn PH, Pedersen-Bjergaard U, Weitgasser R, Lahtela J, Jensen MM, Östenson CG. Effects of patient-reported non-severe hypoglycemia on healthcare resource use, work-time loss, and wellbeing in insulin-treated patients with diabetes in seven European countries. J Med Econ 2013; 16(12): 1453-61.